Physical Description Byte is of average height, and does not look especially powerfully built. General Overview Byte's behaviour programming is based on previous cybernetic work done by the famous Noonien Soong. The Maddox Institute gave priority to other areas of its positronic matrix, and so did not advance Soong's work in any great capacity. Byte and its siblings were brought online with fully-developed sentience, and so Byte's personality has not changed much in the years since its activation. Strengths & Weaknesses Byte has more information in its database than the entire Library of Congress. It holds over two thousand quadrillion bits of data in its memory banks, and has a total linear computational speed of around one-hundred-and-eighty trillion operations per second. Despite these amazing abilities, Byte seems to dwell on its own emotional limitations and appearance. It has previously attempted to scare itself and to induce worry and anxiety in itself, but without success. Hobbies & Interests Byte seems to have a fondness for talking to small children, and is anxious to protect them from confusion of fear that it may engender. This may be due to an incident where Byte inadvertently scared some schoolchildren on tour at the Maddox Institute. Personal History Byte and its two siblings are the culmination of decades of research and development of cybernetics technology. In late 2426, Professor Bruce Maddox's project at the Daystrom Institute (working under the nickname 'The Maddox Institute') came to fruition, when not one but three positronic matrixes were created and switched on. 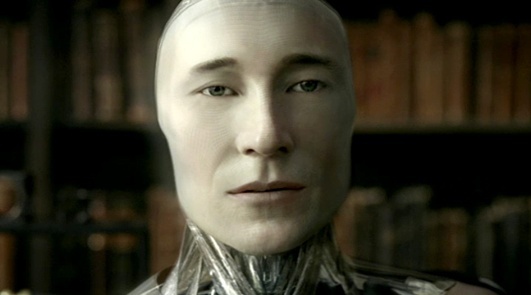 These three new Maddox-type androids were 'born' with full working knowledge databases. The only thing they were not programmed with was their place in the universe - under a legal ruling of 2365 governing the creation of artificial life, these three new life-forms were given the choice of where they wanted to go, what gender to identify with, and what they wanted to do with their lives. Byte chose to identify as male, and chose to join Starfleet. Its incredible processing and computational speeds enabled Byte to graduate in one simple year. However, wary of releasing a potentially socially-retarded android into the fleet, Starfleet assigned Byte to work in the Operations department of Starbase 1 for one year. Following a successful tour on the Starbase, Byte was assigned as Chief Operations Officer aboard the USS DISCOVERY, then about to embark on a mission into the Beta Quadrant on behalf of Starfleet Intelligence. Since news of the Neo-Essentialist threat broke, Byte has remained a loyal and steadfast member of the crew of first the DISCOVERY, and then the PHOENIX. Fully activated in the Daystrom Institute on Mars. Spent several months undergoing testing and observation before choosing gender and purpose. Entered Starfleet Academy. Excelled in all disciplines. Graduated Starfleet Academy. Assigned to Operations staff, Starbase 1. Assigned Chief Operations Officer, USS DISCOVERY. Fled Earth with former Discovery crew aboard the USS PHOENIX, retaining position as Chief Operations Officer. Education Oddly enough, Byte has never been tested or matriculated by any academic authority aside from Starfleet Academy.